We were pleased to present our airports solutions on Stand C4 at FTE Global 2017, the 8th September 2017 at the Mandalay Resort, Las Vegas. It was a great opportunity to demonstrate how cloud technology will deliver next-generation speeds to systems deployment, and how global airports will benefit from our holistic approach to seamless airport integration. Our integrated airport solutions deliver enhanced efficiency and a seamless airport experience around the world. Relied on by more than 170 global airports, airlines and ground handling teams of all sizes, ARINC Airport solutions feature biometrics and next-generation cloud technology to provide a collaborative approach to airport operational management. FTE Global is the industry’s leading Conference and Exhibition, and offers airlines, airports, government agencies, vendors, start-ups, terminal designers, architects, ground handlers, destination partners and various other travel industry stakeholders to define tomorrow’s end-to-end passenger experience and performance strategies at every level. In 2017 FTE delivered even more insight from industry leaders, technology giants, disruptors, academia and start-ups, there will be an even greater variety of formats for education and networking, which will help to keep the event fresh and engaging. We were joined by the air transport and travel industry’s most forward-thinking vendors showcasing their latest products, services and concepts that have been designed to help airlines and airports improve the passenger experience, reduce costs, increase revenues and enhance operational efficiency both on the ground and on-board aircraft. 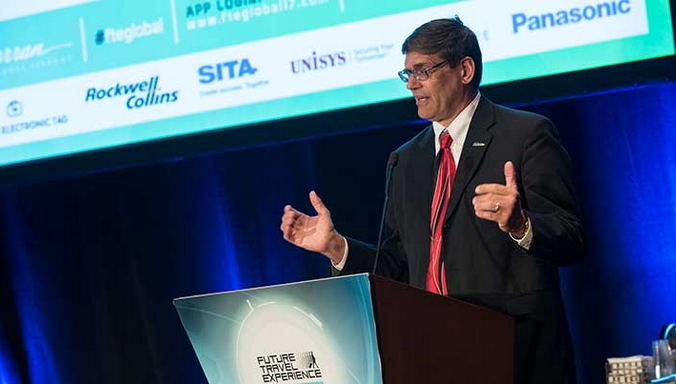 Rockwell Collins’ ARINC Airports solutions lead the way with innovation, integration and solutions to deliver enhanced collaborative opportunities for greater operational efficiency and improved passenger experience.